To All Bunny Lovers: Sadly we lost handsome and feisty little Count Chocula on Wednesday, June 11. A volunteer found Count Chocula lying peacefully on his side in his little home. We are very saddened to lose this adorable little man and not to have been able to fulfill our goal of finding him a forever home. Hi! My name is Count Chocula, formerly Cocoa at Marin Humane Society. 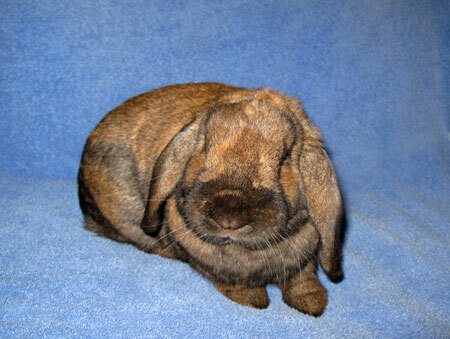 I am a devilishly handsome neutered, mini-lop boy. I'm delightfully sweet, with just the right mix of fire and spirit to make me interesting. In fact, I'm a little picky about who I like to spend time with. Aren't you? Yes, you can gaze upon me, that's easy to understand given my good looks, but it will be up to me to decide if I feel like hanging out with you. When I like someone I love to be petted and talked with. I close my eyes, smile and do bunny chatters and purrs. If you aren't really my type, well, you can admire my bunny behind because I tend to turn my back to people if I am not inspired. Nothing personal, I'm just particular. If I choose you, you can bet that I will be your very loyal friend. So, I hope you will drop by and see me soon. I bet you are the special person I am seeking!